I don't really get Southern gothic stuff. There are a few reasons for this: 1) I'm not a Southerner, 2) I may be a little cynical (I mean, I'm from New York City forcryinoutloud), but I'm not morbid, and 3) I had a lame ex who was really into Murder by Death. 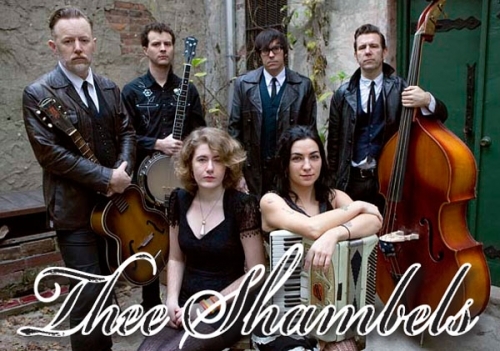 And then Thee Shambels, a Brooklyn-based, self-described "folk noir" band landed on my doorstep. What I'm saying is that their music is really awesome -- awesome enough for me to get past my silly prejudices, and spellbinding enough for me to talk about them here. And you can get four songs for FREE until midnight of the 31st. All for the price of your e-mail address. So what was it about this EP that really grabbed me? For one, I think it's the stylistic diversity among the songs. None of the four sound exactly alike, and that keeps Thee Shambels from becoming too heavy-handed. Also, singer Neville Elder's voice. It sounds like Bourbon and cigars and class. It's enough to make me wish I was a 40-year-old Englishman. So drink up that Kool-Aid. 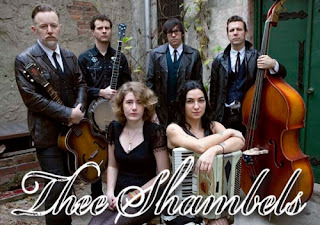 And if you have any more "folk noir" to suggest that, like Thee Shambels, is not overburdened by gimmicks, send 'em on to me.